A complex assembly process, varied tooling and workstation set ups, plus numerous product design changes can contribute to a higher-than-average risk for workplace injuries (musculoskeletal disorders) in the automotive industry. Fortunately, these unique aspects of automotive manufacturing are also the keys to success when addressing workplace ergonomics. 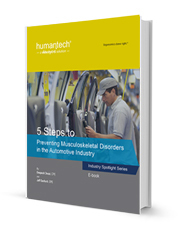 This new e-book, authored by Humantech’s board-certified professional ergonomists, is specific to automotive operations for both OEMs and suppliers. By sharing our experiences, proven approaches, and best practices, you’ll be able to establish an effective and sustainable ergonomics improvement process. Designing your ergonomics process around a continuous improvement approach, while incorporating ergonomic design, will help you realize solid results, improve the lives of your employees, and ultimately impact "time" as a leading currency. identify MSD risk factors that are specific to the automotive industry. establish an ergonomics improvement process that fits your company culture and needs. gain commitment from leaders and collaboration with unions. build and sustain effective engineering controls.